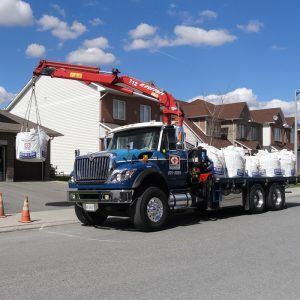 Cubic Yard Bags Ottawa | Greely Sand & Gravel Inc.
Greely does it all…Soil, River Rock, Mulch, Sand, Stone & much more in our cubic yard bags and NEW 1/2 cubic yard bags. We’ve got you covered! What are the benefits of ordering products in bags? 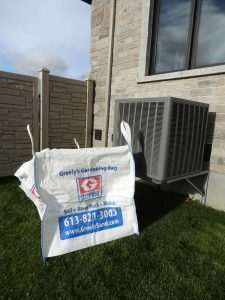 Greely’s Gardening Bags save you the pain and inconvenience of carrying home bags of landscaping products. Simply use what you need, and reseal the bag to complete your landscaping project another day. Greely’s Gardening Bags are clean and convenient! 100% Full Cubic Yard and 1/2 Cubic Yard, Guaranteed! 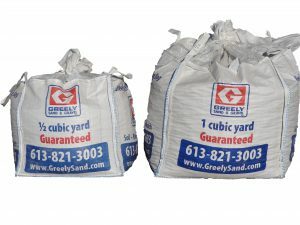 Our cubic yard bags are 3’ X 3’ X 3’. Yes, our bags provide a 100% full cubic yard guaranteed. Our 1/2 cubic yard bags are 2.4′ X 2.4′ X 2.4. Yes, our bags provide a 100% full 1/2 cubic yard guaranteed. What products can I put in the bags? 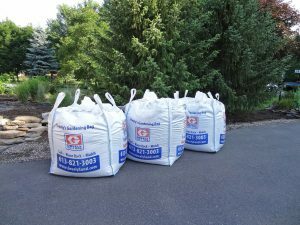 These bags are very convenient and allow you to order soil, mulch, river rock, sand, and crushed stone. Can I have two different products delivered in bags? Yes. 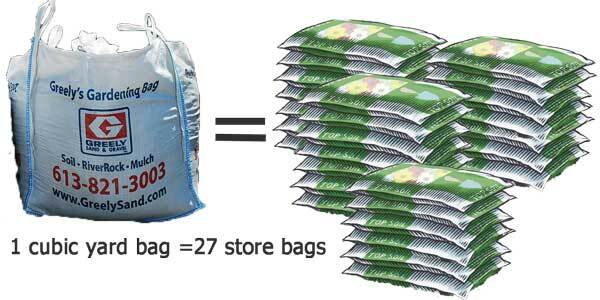 You can order as many bags as you want with different products in each bag. The maximum bags that can be delivered at one time on our boom truck is 8-10 bags. Multiple bag discounts will apply. Yes, you can order online; however, online ordering is closed during the winter season. If you are ordering your cubic yard bag online, you can choose your preferred delivery date. If you order online or via telephone, delivery of cubic yard bags are 2 business days after the time of ordering. Do I have to be home to receive my bag? No, you do not need to be home to receive your Greely’s Gardening Bag. You just need to simply mark an “X” on your driveway with chalk or masking/painter’s tape where you want your Greely’s Gardening Bag(s) to be placed. Keep in mind when marking your “X” on your driveway for a Gardening Bag delivery we need a space 4ft X 4ft. Also, our boom truck will remain on the main road and use the crane to place your Gardening Bag(s) up to 15 feet away from the truck for stone and sand and up to 20 feet away for soil and mulch. If the “X” is not accessible by the boom truck, the driver will place the bag(s) as close as possible to the “X” yet still allow for vehicles to pass by. Be sure to look up and make sure there are no overhead wires or low lying trees where you marked your “X” on your driveway. Can you bring the bag into my backyard? Unfortunately, we are not able to bring the bag into your backyard since we use a knuckle boom crane that is mounted on our truck. Typically bags are placed conveniently on your driveway. How will the bag be delivered? 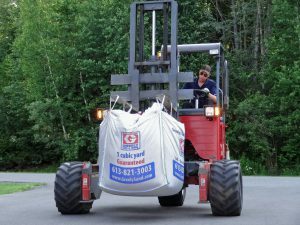 There are two ways we deliver the cubic yard bags. With our tandem axle boom truck with an articulated knuckle boom crane which lifts the bag off the flat deck of the truck, and places it on to your driveway. The crane can reach up to 15 feet (for stone and sand) and up to 20 feet (for soil and mulch) away from the truck, so the truck will not have to drive on to your driveway. The other option is delivery by our flat deck with a Moffett forklift. The Moffett requires 9 feet width of clearance and a stable surface to drive on. 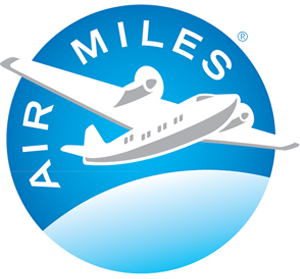 You can earn 10 AIR MILES® reward miles when you purchase the delivery service of landscape materials on a boom truck (see exclusions). Our Greely’s Gardening Bags are delivered by a boom truck. What do I do with the bag once I am finished with it? There are various options you can choose from. Option 1: You can keep the bag for personal use. 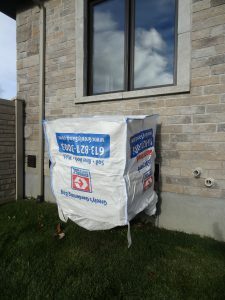 Some ideas include using the bag to cover your air conditioner over the winter months. 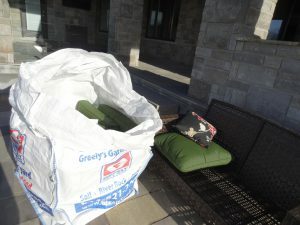 The bag is also great for storage, such as storing patio furniture. Option 2: Choose to use our environmentally friendly DisposaBag Service. This allows you to use your cubic yard bag to get rid of excavation material (old soil, sod, etc. that you dig out of your yard), garden waste (leaves, branches, planting trimmings), or non-hazardous household waste. Option 3: Or you can return the empty bag to one of our two landscape depots located at 1971 Old Prescott Rd. in Greely or 4550 Cambrian Rd. at the corner of Moodie Dr. and Trail Rd. 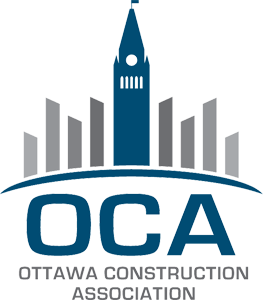 We will recycle the bag at Tomlinson Waste Recovery Centre on Carp Road, Ottawa.